All hands on deck! The central computer turns on emergency power and displays instructions for repair. Time to act! Manage a team of astronauts and restore all damaged systems efficiency. Cleverly move packages and tools. Delegate people on duty in outer space. Use the help of robots. Complete assigned tasks or hinder the work of others! Can you plan efficiently in a claustrophobic room without gravity? Astro Jam is an exciting puzzle game for 2-4 people where the action is set in outer space, combining exciting gameplay a necessity for analytical thinking. 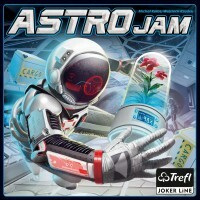 Add a Review for "Astro Jam"